Ring Wars Carolina: Upcoming Event: "Calling You Out!" There comes a time in your life when you just can't take it anymore! Maybe you got some haters spreading rumors or you just want to test your skills against a champion! Maybe you just hate someone and never had the chance to put an end to the confusion? Maybe you just haven't ended the WAR you were in and figured now is the time! The Priscilla King Arena, 612 2nd street in Lumberton NC is, The Place! Ring Wars Carolina presents " Calling You Out!" On April 7, 2018 at 7:00 pm. You, The RWC Family will draw a name and that RWC wrestler will have a chance to "Call out" who they want to wrestle, for 1 night only. Any combination of match, with any stipulation. It could be friend on friend to see who is the better man? It could be a long time feud that never saw the end or the end that you wanted. Nonetheless, It will go down and it will be a history making event. James Anthony has already called out his opponent in Devin Worthy. This contest will be a Lumberton Street Fight. This feud has been going on all over the Carolinas and it is only fitting that it ends in RWC in Lumberton NC. I hope the RWC family is ready for Street Justice from New York or a Tidal Wave from NC Coast! The Main Event is just not a match, not even a Feud, This is World War III! These men have battled all over the East Coast. They have left buildings in piles of rubble. Blood has been shed in over 10 states. One fact still remains, there is no one man standing over the other. 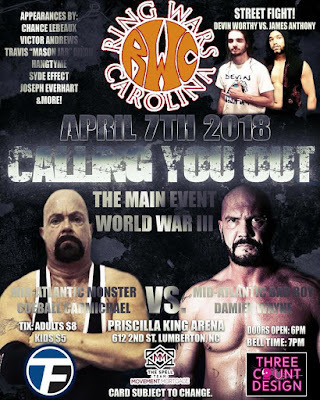 April 7, 2018 in Lumberton NC at the Priscilla King Arena, "The Mid-Atlantic Bad Boy" Damien Wayne declares World War III on "Mid-Atlantic Monster" Cueball Carmichael! Tanks, Helicopters and the Special Forces will not be able to contain this action! There will be a winner and it will be.... The RWC family! All this action plus: Drew Thomas, Chance Lebeaux, Victor Andrews, Travis"Mason Jar" Dixon, Hangtyme, Syde Effect, Joseph Everheart and More! Don't miss "Calling You Out!" April 7, 2018 in Lumberton NC at the Priscilla King Arena located at 612 2nd street!